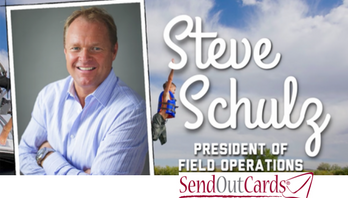 GLOBAL SPEAKER AND LEADER – STEVE SCHULZ, PRESIDENT OF FIELD OPERATIONS AT SEND OUT CARDS AND THE AUTHOR OF “YES, SOMETIMES IT IS ABOUT THE MONEY” SHARES HIS BRILLIANCE AND EXPERIENCE THAT LED HIM TO BECOMING A MULTI MULTI MILLIONAIRE. This night will change the way you do business! If you are tired of looking for your next client but want to take your business to the next level in 2018 – then get your ticket! Bring your spouse, business partners and team members. You are going to hear and learn how an APP on your smartphone is going to be the quickest, easiest and most cost effective way to stay in touch with clients, TOP of MIND and deepen relationships so much so that you are going to increase your referrals and ultimately your income! This is for traditional business owners, MLM Professional Network Marketers, large corporations, franchise owners and anyone who uses a Smartphone. Steve Schulz is the most highly anticipated sought after Speaker GLOBALLY and this is his ONLY stop in Southwest FLORIDA so you don’t want to miss it!